Learn about using the Crystal Reports and SAP BEx components of SAP BusinessObjects, and how both can help optimize your BI environment. Crystal Reports is one of the most prominent and robust tools within the SAP BusinessObjects environment. The reporting system aides in creating standard, formatted reports for compliance regulations. In this section, get an understanding of Crystal Reports, and how to use the application when working with SAP BusinessObjects. Also learn more about SAP BEx, and find out how to use the tools when trying to optimize an SAP BI environment. Of all the tools within the BOBJ-BI environment, none is as recognizable as Crystal Reports, which has been available for quite some time. 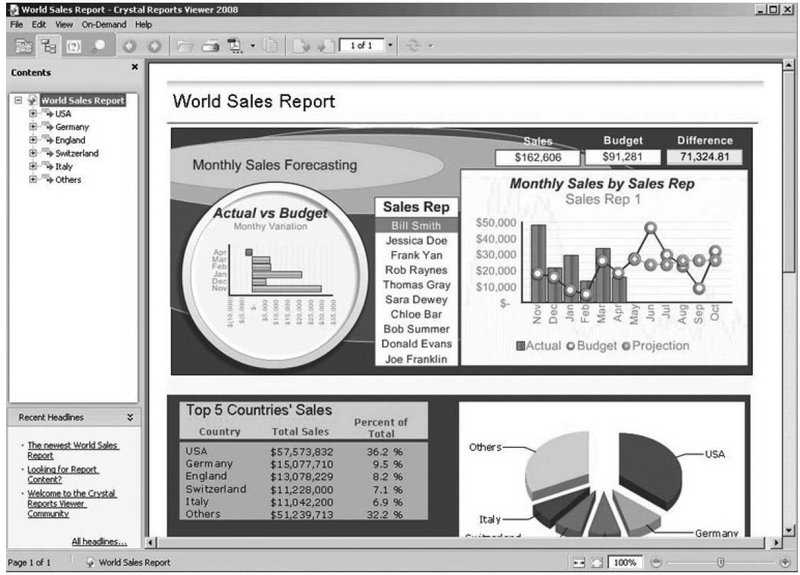 My initial introduction to Crystal Reports was around 2000, when SAP BW was using this as a preferred third-party tool. After its initial owner, Crystal Decisions was bought by Business Objects in 2003, the partnership between Crystal and SAP didn't expand as initially thought and the development of the integration between Crystal and SAP stopped. With the acquisition of Business Objects by SAP in 2007, we are back to using the functionality and formatting of the Crystal Reports toolset to help with the standard formatted reports. Having worked with both the Report Designer in SAP BI and Crystal Reports in BOBJ, I believe SAP is definitely moving in the right direction. Crystal Reports is a very robust reporting system and can definitely satisfy your needs when it comes to generating standard, formatted reports for governmental agencies, and any required reports for stakeholders. If I were to look at just one item for comparison—the ability to use changes that have been made to the underlying query that supports the formatted report—I would immediately give the nod to Crystal Reports. When business users talk about Crystal Reports we talk mostly about the formatted reporting coming from this component. Several layers of integration make up Crystal Reports, but the other components deal with the user interface, server setup for distribution of reports, and other activities that allow users to share the formatted reports. Crystal Reports is designed to work with your database to help you analyze and interpret important information. Crystal Reports makes it easy to create simple reports, and it also has the comprehensive tools you need to produce complex or specialized reports. Crystal Reports is designed to produce the required reports from both SAP and non-SAP data sources. The ability to log on and quickly get up and running with Crystal Reports is enhanced by built-in report wizards to guide you step by step through building reports and completing common reporting tasks. Crystal Reports has many of the same functions (such as formulas, cross-tabs, subreports, and conditional formatting) that most other reporting toolsets have, but the primary difference between Crystal Reports and the others is the formatting functionality. 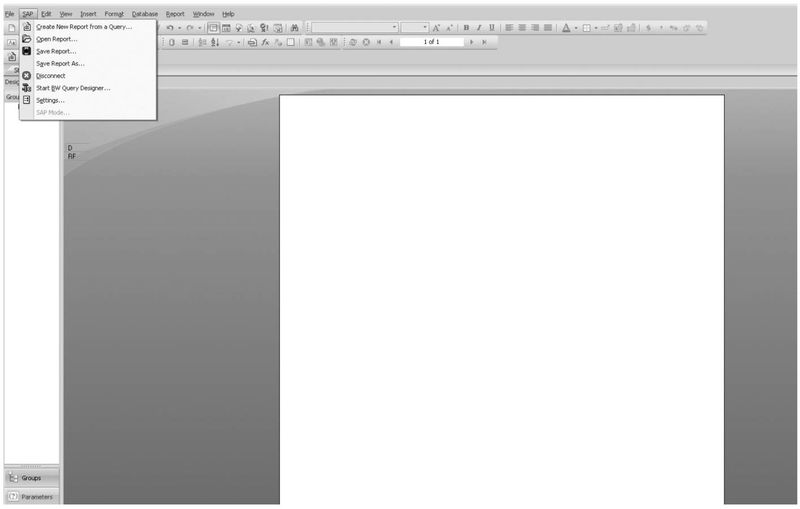 The following illustration shows the initial worksheet or designer for Crystal Reports. As you can see, the SAP menu offers Open Report, Create a New Report from a Query, Start BW Query Designer, and other options, but the goal normally is to develop a formatted report that can be distributed using another component of Crystal Reports—Crystal Server—to a specific group. Normally, these stakeholders are looking for a very nicely formatted report with information that can be shared externally. The look and feel of Crystal Reports hasn't changed much since I initially worked with it eight years ago. The additional functionality that allows you to use a wizard to start your build and guide you through the process should put you in pretty good shape immediately upon starting the process. As with any new system, you will need some time to bone up on some of the features and also how to navigate within the Crystal components rather than having to search and experiment with the parameters while trying to make your deadline for report requirements. So, let's take a look at some results of using Crystal Reports and compare some of the features with, say, Report Designer. I've found that working with Crystal Reports is much easier than working with the Report Designer. Again, I'm a firm believer in the SAP BI toolsets, but as soon as you start to work with each of the reporting components, you will immediately see the differences. In the following illustration, you can see that even Crystal Reports can get into the dashboard mania. This example shows the use of indicators, line chart types, pie chart types, and parameters that are changeable on the fly (click the name and the data changes to that specific person). This is a very nice dashboard, with well-positioned information and a focus on specific information. Dashboarding is not something that everyone using Crystal Reports is looking to do, but it is possible and very straightforward to complete. The hierarchy to the left of the chart also enables you to switch the information to a specific country. Executing this process changes the look of this report but it will still have the look and feel of a dashboard rather than a formatted report. You would be correct in saying that this is not the best business practice, to use Crystal for dashboarding, but the specific activity to focus on in this case would be that we have a structured layout that can be used and distributed. Again, can this be developed and distributed by using Xcelsius—definitely—and would it take on a more complete look—probably. The following illustration shows a more typical view of a report generated from Crystal Reports. Even though we still have some graphics included in the overall report, the information is formatted in a specific manner for delivery. By using the navigation pane to the left, as you access information from different regions, the format of the report will not change but the displayed data will reflect the appropriate region. In this case, the basic column chart type is used to stress the total sales for this company. This report is ready to be printed or distributed to others and is of sufficient quality to be presented to company management. Crystal Reports is fully integrated with the full Microsoft Office suite and can use the integration between a Word document and a PowerPoint presentation to share information and dynamic results. So, you can set up a PowerPoint presentation only once and, depending on the data required, it will be updated and refreshed in the PowerPoint presentation at the same time as the Word document is updated. Using Crystal Reports you can also take the final results from a Crystal Report and export them using PDF, Excel, or Word. This can be a real time-saver because you don't have to reformat a report that was developed in Word and export the results into an Excel spreadsheet. In this case, the flexibility of Crystal Reports doesn't end with creating reports—your reports can be published in a variety of formats, including Microsoft Word and Excel, e-mail, and even over the Web. Advanced Web reporting lets other members of your workgroup view and update shared reports inside their Web browser. In addition, Crystal Reports saves time because all the features are very user-friendly and you can develop a report similar to the one displayed in the previous illustration in a matter of minutes without any training. 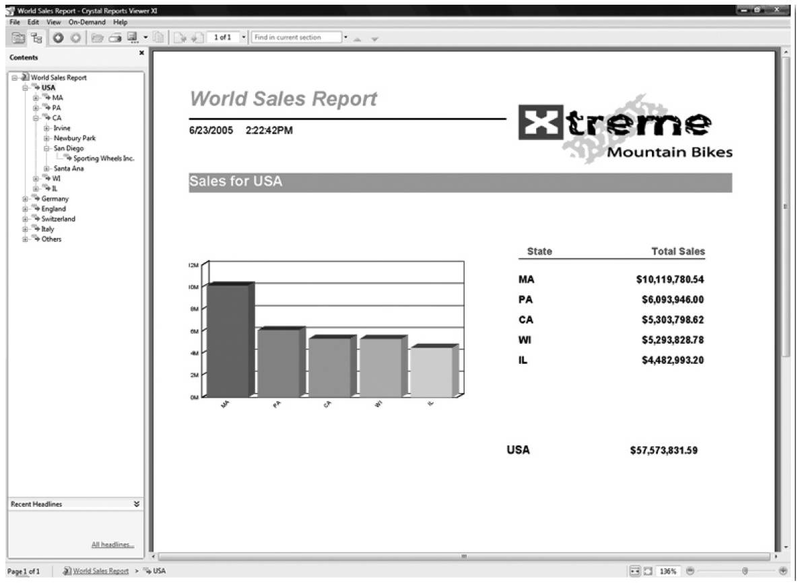 Basically, the features of Crystal Reports include the ability to generate formatted reporting, use static or dynamic data feed reports, offer printing in just about any format, and all of this with a very professional and complete report that can be distributed in multiple different methods, and can also incorporate both SAP and non-SAP information. This is the newest component in the SAP BOBJ-BI suite. SAP BusinessObjects Explorer takes the place of SAP BusinessObjects Polestar. SAP renamed BusinessObjects Polestar to BusinessObjects Explorer to clearly describe the value it provides. BusinessObjects Explorer, accelerated version for SAP NetWeaver Business Warehouse, brings together intuitive information search and exploration combined with high performance and scalability made possible by SAP NetWeaver Business Warehouse Accelerator (BWA). One of the main issues encountered with the other reporting toolsets was the inability to manipulate both structured and nonstructured data quickly. The combination of BusinessObjects Explorer and BW Accelerator resolves this issue. Using BusinessObjects Explorer, the business user can work with information on the fly and generate results for questions that are being asked at that time. In this way, the analyst doesn't need to wait for the BI IT department to pull together the information into a query or universe. The only requirement at this time is that all data must be either SAP BW data or non-SAP data, not a mix of the two. In the future, this component will be able to navigate against both types of data at the same time, but for now it must be either one or the other. Using the BW Accelerator, SAP BusinessObjects Explorer is able to link directly to the BW InfoCubes, without the additional layer of either universes or BEx queries, and search through the information at very fast speeds. In some of the implementations of the BW Accelerator that I've been involved in, we have experienced increases in query performance from several minutes to pull the data and display to several seconds to generate the report. If the performance of the BW Accelerator directly against a reporting component is similarly impressive, your query will definitely perform much faster than in any other reporting component within the BOBJ suite. Power users, who understand the structures of the underlying BW data sources (BW InfoCubes), use SAP BusinessObjects Explorer to create Information Spaces, which are sets of contextually related objects selected directly from an SAP BW Accelerator index enabled for Explorer. New Information Spaces need to be indexed once, in order to generate the metadata required by the Explorer search engine. This is a very similar process that occurs using the BW Accelerator outside of the Explorer for performance improvements against BEx queries. Because BW Accelerator indexes are consumed directly, the values visible to users are always the latest, up-to-date values on the underlying BW InfoCube. Information consumers and analysts search and explore Information Spaces to create personal exploration views of the data and can then distribute the information across a group of analysts to develop additional information to help drive business for their corporation. The functionality available with the BOBJ Explorer is not quite the same as the other reporting tools since it is used primarily for analysis and the sorting of data mining information, there are few formatting and context menu functions to work with. Accessing BOBJ Explorer is similar to accessing a search engine screen on the Internet, while other reporting tools present you with a selection of reports for execution. Most of the basic functions are available, such as generating reports and queries, using charts and graphics to display the information, and some navigational functions, but the primary goal of the Explorer is to allow you to obtain information and answers at the speed of thought. Parameters exist to allow the distribution of the data, but over and above that, the information is displayed as is for analysis. Using BusinessObjects Explorer, you can query on terabytes of data and generate an answer for a customer immediately while you are on the phone with that customer and not have to get back to them with decisions on product cost, price, and shipping information. With this reporting tool, your business analysts can discuss areas of concern and get answers for questions immediately and not have to go through the process of getting a change request from the BW IT department. If this reduces the workload on the BW IT group, that is another benefit. Because business and power users can obtain information immediately, they can develop their own reports and test the information immediately. This requires a user interface that is user friendly and easy to work with, which is a trait of all the BOBJ products. The rollout of the BusinessObjects reporting components is in its early stages. SAP is developing some extensions to these components with items such as Pioneer to support more detailed analysis and other enhancements in the integration of these reporting toolsets and the NetWeaver platform. All in all, you will have your choice of either or both sets of reporting objects. The support for the older-version BI reporting tools—WAD, BEx Web Analyzer, BEx Analyzer, Report Designer, and others—will continue through 2014 at least, after which these reporting features will be available but may not have as much support. SAP has already ceased further development of these components, but support is still available. In any case, understanding the differences and features that you get with both sets of components is important, and even if you decide not to go any further in the use of or configuration of any BusinessObjects components, it is important to understand each and where it fits into the SAP landscape. You will find that SAP is moving to incorporate these components into many of its other product lines that are supported by NetWeaver platforms such as the BPC component. In BPC the integration will take place with all of the BOBJ reporting tools, which will support Excel functionality and have access to all of the Microsoft Office suite including the ability to integrate and use Excel, Word, and PowerPoint dynamically. If you are a BW/BI consultant in the SAP and Web environments, you really have no choice but to learn how to use these additional tools. The final versions of the reporting objects will be hybrids of the best of each company—SAP and Business Objects—and offer significant best business practice reporting components and processes.